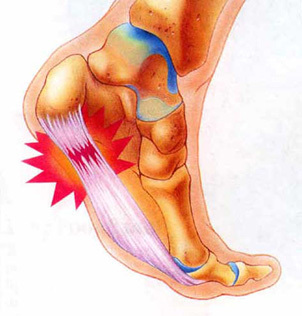 Plantar fasciitis is inflammation of the ligament that stretches from the back of the heel to the ball of the foot. Known as the plantar fascia ligament, it is responsible for supporting the arch of the foot. It is one of the most common conditions that affect the feet, occurring in about 10% of all Americans at some point in their lifetime. Reportedly, some two million Americans seek treatment each year. Pain, located at the bottom of the heel, is the most common symptom. The pain is often most intense during the early morning, accompanying the first few steps of the day. Difficulty flexing the foot so that the toes point upwards in the direction of the shin is another symptom, although many people do not notice the stiffness, as it occurs gradually over time. In athletes and runners, the cause is often inadequate stretching. In non-athletes, the condition is more common in people that are overweight. Standing or walking for many hours during the day is a common cause. It is sometimes a work-related injury. Running, especially in shoes with little or no arch support, can eventually cause the ligament to become overstretched. The arches can fall and pain is the result. Flat feet and fallen arches can cause plantar fasciitis, although the pain from fallen arches may affect the entire foot. In plantar fasciitis, the pain is focused primarily on the bottom of the heel. High arches can cause the problem, too. Although they are not believed to be a cause, heel spurs are often found to accompany plantar fasciitis. Spurs are bone deposits that form on the heel bone. They can form on the back or bottom of the heel bone. When they accompany plantar fasciitis, they are usually found on the bottom of the heel bone. Surgical procedures can release the tension, but they are accompanied by numerous risks, which include injury to the nerves, infection and rupture of the ligament. In addition, surgery does not always reduce or relieve the pain. So, it is typically chosen as a last resort. Injection of corticosteroids or the use of non-steroidal anti-inflammatory drugs (NSAIDs) is sometimes chosen to relieve pain, but those treatments are of limited benefit. Side effects are a problem, as is damage that can be done to the liver, with continued use of NSAIDs. The best choices for treatment are those that do not involve drugs or surgery. If you suffer from the condition, here’s what you should do. If you follow these steps, you should notice an improvement in your plantar fasciitis in a very short time.